Readings: Gen 15:5-12, 17-18; Phi 3:17-4:1; Lk 9:28b-36. 1/ First Reading: NAB Genesis 15:5 He took him outside and said: "Look up at the sky and count the stars, if you can. Just so," he added, "shall your descendants be." 6 Abram put his faith in the LORD, who credited it to him as an act of righteousness. 7 He then said to him, "I am the LORD who brought you from Ur of the Chaldeans to give you this land as a possession." 8 "O Lord GOD," he asked, "How am I to know that I shall possess it?" 9 He answered him, "Bring me a three-year-old heifer, a three-year-old she-goat, a three-year-old ram, a turtle-dove, and a young pigeon." 10 He brought him all these, split them in two, and placed each half opposite the other; but the birds he did not cut up. 11 Birds of prey swooped down on the carcasses, but Abram stayed with them. 12 As the sun was about to set, a trance fell upon Abram, and a deep, terrifying darkness enveloped him. 17 When the sun had set and it was dark, there appeared a smoking brazier and a flaming torch, which passed between those pieces. 18 It was on that occasion that the LORD made a covenant with Abram, saying: "To your descendants I give this land, from the Wadi of Egypt to the Great River (the Euphrates). 2/ Second Reading: NAB Philippians 3:17 Join with others in being imitators of me, brothers, and observe those who thus conduct themselves according to the model you have in us. 18 For many, as I have often told you and now tell you even in tears, conduct themselves as enemies of the cross of Christ. 19 Their end is destruction. Their God is their stomach; their glory is in their "shame." Their minds are occupied with earthly things. 20 But our citizenship is in heaven, and from it we also await a savior, the Lord Jesus Christ. 21 He will change our lowly body to conform with his glorified body by the power that enables him also to bring all things into subjection to himself. 4:1 Therefore, my brothers, whom I love and long for, my joy and crown, in this way stand firm in the Lord, beloved. 3/ Gospel: NAB Luke 9:28 About eight days after he said this, he took Peter, John, and James and went up the mountain to pray. 29 While he was praying his face changed in appearance and his clothing became dazzling white. 30 And behold, two men were conversing with him, Moses and Elijah, 31 who appeared in glory and spoke of his exodus that he was going to accomplish in Jerusalem. 32 Peter and his companions had been overcome by sleep, but becoming fully awake, they saw his glory and the two men standing with him. 33 As they were about to part from him, Peter said to Jesus, "Master, it is good that we are here; let us make three tents, one for you, one for Moses, and one for Elijah." But he did not know what he was saying. 34 While he was still speaking, a cloud came and cast a shadow over them, and they became frightened when they entered the cloud. 35 Then from the cloud came a voice that said, "This is my chosen Son; listen to him." 36 After the voice had spoken, Jesus was found alone. They fell silent and did not at that time tell anyone what they had seen. Written by: Anthony Tien M. Dinh, O.P. People live and act because of their hope; for examples, a student goes to school because he hopes for the day of graduation; a farmer works hard because of his hope for the harvest day; an olympic athlete trains day and night because he hopes for the day when he shall stand on the platform to receive a gold medal; a Christian practices his religion with the hope that he shall live with God forever in heaven. Hope is very important and necessary for people; without hope people have no energy to live, to advance, and especially to overcome all obstacles in their life. When hoping, people need to know the certainty of what they hope for and their ability to reach it; not in an illusory hope or in thing which they can’t reach it. The readings of the second Sunday of Lent highlight the faithful’s hope on God’s promises and their certainties in the human history. In the first reading, God promised to give Abraham descendants as many as stars of the sky and a promise land. This promise was certified with the bodies of animal were splitted in two. In the second reading, St. Paul advised the faithful to firmly hope in Christ who has power to transform their lowly bodies to conform with his glorified body in the next life. In the Gospel, Jesus took his three apostles to the top of a mountain to reveal for them his divinity and to let them hear his Father’s witness so that they can be firm to face his Passion and Death which are going to happen in Jerusalem. 1/ Reading I: God promised to give Abraham descendants and a promise land. (1) Descendants: God took Abraham outside and said: “"Look up at the sky and count the stars, if you can. Just so," he added, "shall your descendants be. "” This is a great challenge for Abraham’s faith because he only had two sons: Isaac from Sarah, his wife; and Ismael from Hagar, Sarah’s maidservant. How can he have descendants as stars on the sky? But “Abram put his faith in the Lord, who credited it to him as an act of righteousness.” God’s promise wasn’t fulfilled during Abraham’s life on earth; but today, more than half of the world’s population claim they are Abraham’s descendants. These people belong to Judaism, Christianity and Islam. (2) A promise land: God continued to say to Abraham, “I am the Lord who brought you from Ur of the Chaldeans to give you this land as a possession ... To your descendants I give this land, from the Wadi of Egypt to the Great River (the Euphrates).” This was also not fulfilled when Abraham was living; but after God led the Israelites out of Egypt and into this promise land, which is Canaan, full of milk and honey. Some commentators think “birds of prey” is the symbol of temptations which shall come from Abraham’s side so that he might not believe in God’s promises. They were chased out due to his faith. 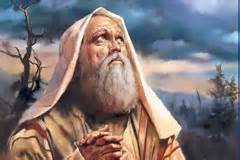 The strange phenomena happened for Abraham signified the seriousness of the covenant. The fact of “a flaming torch which passed between those pieces” is the symbol for God’s presence (cf. Exo 3:2; 13:21; 19:18). The covenant was completely made by God; that is the reason why only God passed through the offerings. (1) Those who don’t have hope in the next life: Those who live against Christ’s cross are the Jews who don’t believe Christ was sent by God to redeem people’s sins by his death on the cross. They shall be destroyed in their sins. Those who have “their God is their stomach” might be the Epicureans; they are satisfied with what the present world offers. They concern only about the present life so they spend all of their time and effort to satisfy their material needs. “Their glory is in their “shame”” might imply the circumcision which the Jews are very proud of it. To the faithful, even though they are living in this world, but their eyes are always orientated to their ultimate goal which is the eternal life. The faithful’s hope is guaranteed by Christ’s blood, had been poured out to purify their sins; and Christ gloriously resurrected and ascended to heaven to prepare the future life for his faithful. 2.2/ We must live as those who have hope in the next life: St. Paul advised the faithful to imitate him, “Brothers, I for my part do not consider myself to have taken possession. Just one thing: forgetting what lies behind but straining forward to what lies ahead, I continue my pursuit toward the goal, the prize of God's upward calling, in Christ Jesus” (Phi 3:13-14). Paul both wanted to repeat what Christ has promised and to prove that he is the living witness for the hope in the eternal life. If the faithful firmly hope in the future life, they must express this hope in their life by believing and practicing all what Christ taught; they can’t live as those who don’t believe in Christ nor the next life. 3.1/ Jesus’ transfiguration: Today passage must be understood with Peter’s confession about Jesus’ divinity and his first time foretelling of his Passion, Death and Resurrection in Jerusalem (Lk 9:18-22). Jesus’ purpose in bringing Peter, James and John to the top of a mountain is for them to see his glorious divinity. Jesus foreknew what shall happen to his disciples when they must witness his Passion, so he wanted them to witness his true glory with a hope that it might help them to overcome their fear and desperation to courageously witness for him. He also wanted to teach them that he, as the Messiah, must go through the way of the cross to liberate people from sins and death, and to bring salvation for them. (1) St. Luke reported, “While he was praying his face changed in appearance and his clothing became dazzling white.” We can’t draw out a lots from this short description, but we can guess the three disciples had seen Jesus as he truly is, or at least, it is close to the “beatific vision” which we are longing for. (2) Who are the two people who appeared and conversed with Jesus: Luke identified them as Moses and Elijah. Moses represents for the law and Elijah for the prophet. This fact implies that Jesus is both the fulfillment of God’s plan of salvation and the goal which the law and the prophet must turn to. It also implies that Jesus’ coming Passion, Death and Resurrection belongs to God’s plan of salvation. (4) Peter’s reaction: As they were about to part from him, Peter said to Jesus, "Master, it is good that we are here; let us make three tents, one for you, one for Moses, and one for Elijah." But he did not know what he was saying. While he was still speaking, a cloud came and cast a shadow over them, and they became frightened when they entered the cloud.” Two times in Luke’s Gospel when Jesus brought the three to the mountain to pray, they fell to sleep (cf. 22:40ff). Lethargy can make people not clearly conscious of what are happening and acting clumsy. Praying makes people awake and understanding of God’s instruction. (5) The Father witnessed for Jesus: The disciples heard the Father’s witness through a voice coming from heaven which said, “This is my chosen Son; listen to him.” According to the Synoptists, this is the second time Jesus’ Father witnessed for him; the first time happened at Jesus’ baptism on Jordan River (cf. Mt 3:17; Mk 1:11; Lk 3:22). The Father confirmed what Peter confessed and wanted the disciples to obey what Jesus commanded them. - Not like people who often change and violate their promises; when God promises something, He is loyal to His promise. We should put our complete trust in God’s promise. - What God promised with our forefathers were achieved and fulfilled in Christ, His beloved Son, through his Passion, Death and glorious Resurrection. - Our hope in the eternal life must be our ultimate goal and we should always base on it to make our decisions and to overcome all obstacles in this life. This hope not only helps us in the next life but also gives us energy to live joyful and to be happy in this life. - Trials and sufferings are necessary for us to show our faith and love for God. Abraham, St. Paul and all Jesus’ disciples must struggle with many temptations to have a firm hope in God’s promises. - What God promises, He will do it. When He shall do, we don’t know because He doesn’t depend on time.